Dynamic, dedicated and determined, Narendra Modi arrives as a ray of hope in the lives of a billion Indians. His laser focus on development and his proven ability to deliver results have made him one of India’s most popular leaders. His promise is to build a nation that is strong, prosperous and inclusive, where each and every Indian can realize their hopes and aspirations. 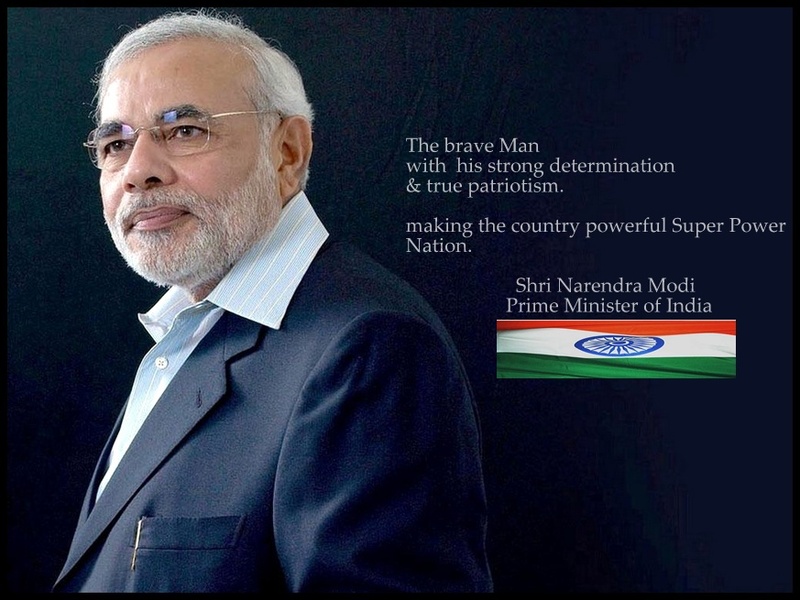 On the 26th May 2014 Narendra Modi took oath as the Prime Minister of India. He made his mark on both the Indian and global stage as the chief minister of the western state of Gujarat for a record four terms. There, he brought about a paradigm shift in people’s lives by delivering pro-citizen good governance, where the state served its people humbly and honestly. He transformed Gujarat, which was reeling from the aftereffects of a devastating earthquake, into a growth engine that made a strong contribution to India’s development. Narendra Modi has achieved all this thanks to hard work and the values instilled in his childhood. Born on 17 September 1950 in a small town in Gujarat, he grew up in a loving but poor family ‘without a spare rupee’. The initial hardships of life not only taught the value of hard work but also revealed to him the avoidable sufferings of the common people. That is why as chief minister, he lived his life by the principle of ‘Antyodaya’, of serving the last person in the queue. From a very young age he immersed himself in service to the nation, working with patriotic organisations. He completed his MA from Gujarat University. He is a ‘people’s leader’, dedicated to improving their well-being. Nothing is more pleasing to Modi than being among ordinary people, sharing their joys and alleviating their sorrows. His powerful, personal ‘connect’ on the ground is complemented by a strong presence online where he is known as India’s most techno-savvy leader, using the web to reach people and bring about change in their lives. He is very active on social media, including Facebook, Twitter, Google+ and other forums. Narendra Modi’s inspiring life journey to the Office of Prime Minister began in the by-lanes of Vadnagar, a small town in North Gujarat’s Mehsana district. He was born on the 17th of September 1950; three years after India had gained its Independence. This makes him the first Prime Minister to be born in independent India. Mr. Modi is the third child born to Damodardas Modi and Hiraba Modi. Mr. Modi comes from a family of humble origins and modest means. The entire family lived in a small single storey house which was approximately 40 feet by 12 feet. Narendra Modi’s formative years taught him early tough lessons as he balanced his studies, non-academic life to spare time to work at the family owned Tea Stall as the family struggled to make ends meet. His school friends remember that as a child also he was very industrious and had an affinity for debates and a curiosity to read books. Schoolmates recollect how Mr. Modi used to spend many hours reading in the local Library. As a child he was also fond of swimming. Mr. Modi’s thoughts and dreams as a child were quite removed from how most children of his age thought. Perhaps it was the influence of Vadnagar which once used to be a vibrant center of Buddhist learning and spirituality many centuries ago. As a child also he always felt a strong urge to make a difference to society. He was highly influenced by the works of Swami Vivekananda which laid the foundation of his journey towards spiritualism and which inspired him to pursue the mission to fulfill Swamiji’s dream of making India a Jagat Guru. At the age of 17 he left home to travel across India. For two years he travelled across the expansive landscape of India exploring various cultures. When he returned home he was a changed man with a clear aim of what he wanted to achieve in life. He went to Amdavad and joined Rashtriya Swayamsevak Sangh (RSS). RSS is a socio-cultural organisation working towards the social and cultural regeneration of India. It was a tough routine for Narendra Modi in Amdavad since 1972 when he became a Pracharak for RSS. His day began at 5 am and went on till late night. Late 1970s also saw a young Narendra Modi join the movement to restore Democracy in India which was reeling under Emergency. While continuing to shoulder different responsibilities within the Sangh during the 1980s Narendra Modi emerged as an Organizer exemplar with his organizing skills. In 1987 a different chapter began in the life of Mr. Modi when he started work as the General Secretary of the BJP in Gujarat. In his first task Mr. Modi won a victory for the BJP in Ahmedabad Municipal Corporation elections for the first time ever. He also ensured that the BJP was a close second to the Congress in the 1990 Gujarat Assembly elections. In the 1995 Assembly elections Mr. Modi’s organizational skills ensured the BJP’s vote share increased and the party won 121 seats in the Assembly. Narendra Modi’s evolution from quintessential Organization Man of the BJP to one of India’s best known leaders recognized for his Good Governance over a span of a decade tells a story of grit, determination and Strong Leadership in the face of grave adversity. Narendra Modi’s transition from the world of Political Organizing to the realm of Administration and Governance neither had the luxury of time nor the benefit of training. Shri Modi had to learn the ropes of Administration while on the job right from Day One. Narendra Modi’s first 100 days in office offer a glimpse of not just how Shri Modi made that personal transition but these 100 days also offer a glimpse of how Shri Modi brought unconventional thinking and out of the box ideas to shake status-quo and reform Governance. Narendra Modi’s path to creating a Vibrant Gujarat as a shining example of Development and Governance did not come easy. It was a path littered with adversities and challenges. Through the last decade if there is one constant trait of Narendra Modi that has stood out it is his Strong Leadership in the face of grave adversity. Shri Narendra Modi’s approach to governance has always been viewed as being above politics. Shri Modi never let political differences get in the way of pursuing solutions to developmental challenges. As Shri Narendra Modi prepares to assume Office as India’s next Prime Minister, his approach to Administration and Governance stands out for its convergent thinking. The finest manifestation of Shri Modi’s philosophy of “Minimum Government, Maximum Governance” is his Pancha-Amrut construct for convergent Governance.